Click here for more information on the Business Alliance program. Starline Brass is a family owned business known for making the highest quality brass case available. They have been in business for more than 30 years. Starline has a 30,000 square-foot manufacturing facility located in Sedalia, MO. Their unique manufacturing process and commitment to their customers sets them apart from their competition. Forrest Keeling Nursery is the world-renowned originator of the RPM (root production method®) RPM technology. The company’s patented RPM tree technology yields unsurpassed survivability and plant growth, which makes Forrest Keeling plants the benchmark for wetland restorations and large-scale installations in any application. In fact, superior growth rates make RPM trees the standards for problem-solving plantings including carbon sequestration, vegetative environmental buffers and reforestation. Lilleys’ Landing Resort and Marina in Branson, Missouri, is the year-round spot you’re looking for to enjoy both the tourist sites and the restive Ozarks waterfront along Lake Taneycomo. Nestled between gently sloping pasture land and the 300-foot bluffs on the opposite bank, the grounds are buffered to traffic bustle, even though the Music Country Blvd. “strip” is just two miles away. As one of the small, family-run resorts on Lake Taneycomo, Lilleys’ Landing is close to many back roads that lead to area attractions. With free wireless internet you can be as connected as you want to be, but we won’t tell your co-workers — unless they come with you for a work/play lakeside conference. Nothing like fly fishing all together in a boat for the ultimate team building time. National Feather-Craft Co. is a St. Louis Fly Shop located just 15-minutes from Lambert St. Louis International Airport. It is a fun, relaxing place to shop or just hang out during a layover. Fly tying demonstrations and a six position casting yard are at your service. Stop by for a visit next time you’re in town for all your fly fishing needs. Mitico Solves today’s mitigation needs by restoring, enhancing, and preserving natural resources for future generation. Mitico is lead by Wally Iman, CFM board member, and his business partner Matthew W. Roth. Missouri Wildflowers Nursery have been growing and selling native plants and seeds since 1984. Missouri is the genetic origin of our plants, so they are best adapted to states east of the Rockies. View our plants online visit the nursery just south of Jefferson City, MO. Advantage Metals Recycling buys common household ferrous and nonferrous scrap metal items like automobiles, appliances, sheet metal, aluminum cans and other aluminum, copper and brass products. State-of-the-art technology is utilized to allow customers to quickly and efficiently recycle their scrap metal and receive payment on site. AMR operates 16 scrap metal recycling locations across Kansas and Missouri and is wholly owned by The David J. Joseph Company (DJJ). Logboat Brewery The premiere cool brewery serving house draft beers in an industrial space with reclaimed wood & a long pine bar. Located in Columbia, Missouri, and now serving statewide. Simmons Optics Since 1983, Simmons® has established itself as a visionary leader in high-quality, high-value riflescopes and binoculars. For over 25 years, hunters and sportsmen alike have looked to Simmons for extraordinary optical innovation and rugged durability. Holladay Distillery 160 years in the making, the Holladay Distillery is the oldest distillery west of the Mississippi River still located on its original site and is the proud home of McCormick Distilling Company. Nestled in the rolling hills of Weston, Missouri, the distillery is rich in history and full of surprises. Read more about how it all began and how the company has evolved to where we are today. Beginning in Spring 2016, stop by for a tour to see it all for yourself! Trailerman Trailers, Inc. is a successful, quality driven trailer manufacturer located in the Midwest, only a few miles from the beautiful Mississippi River. Trailerman has been building high quality, sturdy construction, and competitively priced trailers for over 19 years. We have established a reputation as an industry leading trailer manufacturer with an excellent product and even better customer service. Trailerman believes in building a trailer that we would be proud to use ourselves. 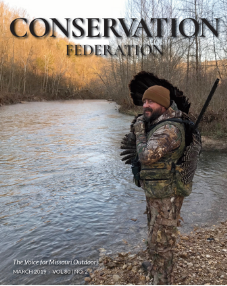 Missouri Conservation Heritage Foundation is a nonprofit, charitable organization that helps meet financial needs placed on natural resource conservation and conservation-related outdoor recreation. Since their founding in 1997, they have allocated over $20 million for conservation funding statewide. They are separate from the Missouri Department of Conservation but support that agency’s mission of protecting the state’s forest, fish and wildlife resources for all Missourians.